Does body checking belong in female hockey? Would adding body checking back into female hockey make it safer for players or would it do more harm than good? The issue of body checking in girls’ and women’s hockey always sparks a heated debate. Those who support putting full checking back in the female game believe that this will teach girls to play with their heads up and prevent a lot of the serious injuries that are happening out on the ice from both accidental and intentional contact. But would adding body checking back into female hockey make it safer for players or would it do more harm than good? I personally don’t believe that body checking should be added back into the female game, but I do think that girls’ hockey players need to be taught how to take a hit properly, as well as how to initiate body contact properly. Girls are getting hit and getting hurt because of their inability to protect themselves from body contact and something needs to be done. Girls need to learn how to play “heads-up” hockey and putting body checking back into the game seems like the easiest way to teach this skill to players. Once a player gets run over in mid-ice or gets the wind knocked out of her from a bone-crushing check against the boards, she will “learn” to keep her head up to protect herself. While I don’t entirely disagree with this “trial by fire” way of teaching players to protect themselves, the reality is that the majority of injuries in girls’ hockey are happening from incidental contact and are not due to intentional checking. 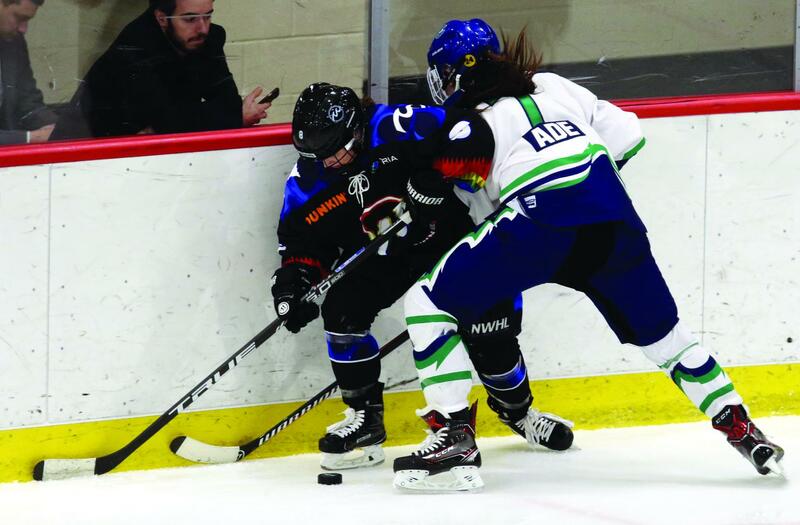 Girls’ hockey players are not getting hurt because their opponents are trying to hip-check them through the boards or lining them up at the blue line for the big hit. Girls are getting hurt battling for the puck along the boards and in front of the net. One of the big reason girls are getting hurt by this incidental contact is that they lack the awareness that they are going to get hit. When a men’s hockey player is skating down the ice, he is always thinking, “I am going to get hit.” For girls’ hockey players, this thought rarely crosses their minds. They tend to skate with their heads down, looking and “fishing” for the puck, as opposed to playing the heads-up style of hockey that is critical for survival in the men’s game. If girls aren’t playing with their heads up, they are oblivious to what’s going on around them and aren’t going to be ready for contact. Playing “heads-up” hockey means that you will be able to see contact coming. Once girls’ hockey players are aware of the fact that they might get hit, they have three options for dealing with contact. 1. Get out of the way: This is always the safest and smartest decision, but there is not always the time and space for this to be possible. 2. Take the full force of the hit: This is the passive option and the most dangerous one. Unfortunately, most girls are not taught how to deal with contact properly and this is the option that they take most often. 3. Initiate contact: This is the active option and your safest one if you aren’t in a position to be able to avoid the contact entirely. Instead of letting yourself get flattened against the boards, taking a step into the oncoming player and leaning into them will decrease the amount of force that your opponent can deliver with the check. Actively moving into the check will go a long way to protecting girls from sustaining an injury with contact. We need to educate girls about how they can protect themselves and give them the tools they need to not only survive, but thrive, in the female game. Before girls even step on the ice, they need to be aware that there is going to be contact. Once they are on the ice, they have to play with their heads up to see when contact is coming. And when that contact happens, they have to be ready and actively move into contact instead of being passive. There is a big difference between teaching girls to play “heads-up” hockey and teaching them how to body check. While bringing body checking back to the women’s game will force girls to be more aware of contact, this change also will make the game more about strength and survival, and less about speed and skill. The girls game is different and the rules are different for a reason. Teach girls how to play with their heads up, and how to be active instead of passive when it comes to contact, but leave the full body checking to the boys. To learn more about how to use what you do off the ice to take your game to the next level on the ice, click here. Kim McCullough, MSc, YCS, is an expert in the development of aspiring female hockey players. She is a former NCAA Division I captain and played in the National Women’s Hockey League for six years. She is currently the Director and Founder of Total Female Hockey as well as the head coach of the Toronto-Leaside Junior Wildcats in the Provincial Women’s Hockey League.